Up to 1000BC, something like four fifths of Europe north of the Alps and the Pyrenees was covered by dense forest. Over the next two hundred years, extensive clearance by farmers provided the basis for new growth through local trade, notably from the fairs dating from Charlemagne. This growth brought an unprecedented demand for herding dogs, both to control herds and get them to market. Bruges became the chief European wool manufacturing town and medieval Flanders and its neighbours produced a wide range of driving dogs, as the Bouvier breeds demonstrate. As increasing urbanization occurs in Europe, the pastoral breeds are vulnerable; their past value has been forgotten. The need for guarding and moving sheep has lessened or been mechanized. The French pastoral breeds are now becoming more popular in Britain, with the Pyrenean Sheepdog or Labrit, the Briard and the Beauceron appearing in our show rings. 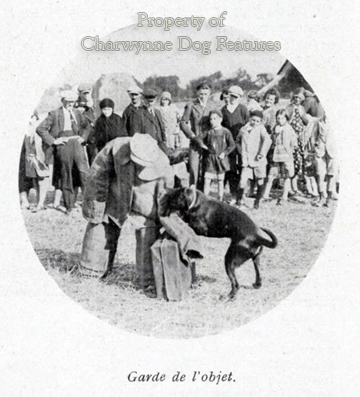 The Labrit, probably getting its name from the town of that name in the south of France, (although some suggest it comes from de la Brie, since it is Briard-like and there was a tendency in the last century to call all French smooth-haired shepherd dogs chiens de Beauce and all coarse-haired dogs chiens de Brie) has now been embraced by the Pyrenean Sheepdog. 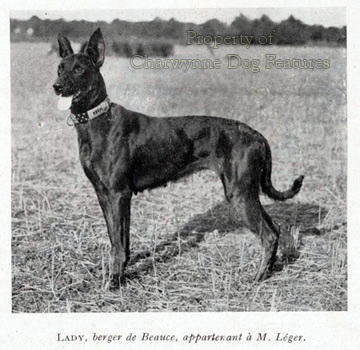 The Berger de Bresse is almost certainly now lost to us and the Berger de Savoie, Beauceron-like but drop-eared, may too not have survived. Little is heard of the Picardie Sheepdog. We have probably lost more types of herding-dog all over Europe than of any other group; the pastoral scene has changed dramatically in this century and the advent of the pedigree dog has seen human whim play its part too. But this group of dogs have given man supremely loyal and devoted service over many centuries and whether French in origin or British deserve our gratitude. The French herding breed whichimpresses me the most in that country however is the Beauceron, a strapping handsome dog with the majesty of the Akita and the alertness of the Dobermann. 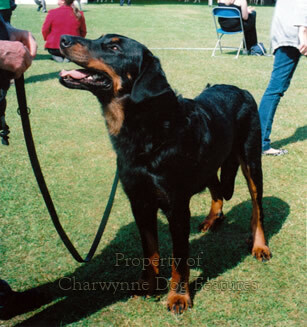 (I strongly suspect that Herr Dobermann resorted to Beauceron blood in the creation of his breed). Black and tan or harlequin and sometimes dubbed 'bas rouge' or red stockings because of its red-tan legs, the Beauceron is little known outside France but is attracting interest both here and in the United States where a breed club has been formed and a stud-book opened. A big, robust, powerful, muscular but not heavy breed, 26" at the withers, very strong-minded and rather fierce in appearance, it is one of the few breeds whose strength of will you can sense and whilst it lacks the "strong eye" of our working sheepdogs, its work with cattle is in the brusque no-nonsense style. They have been used by both the French army and the police and my French friends tell me they were originally hunting dogs used on boar and stag, representing an ancient French type. 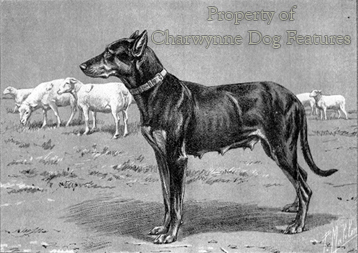 The harlequin factor is found in hounds, as the Dunker hound, the Great Dane and the Dachshund illustrate; the "merling" of the Beauceron is more like the hound-colouration than that found in collies. French shepherds believed that double dew-claws on the hindlegs denoted herding skill in a dog; the Beauceron featuring this unusual addition today. 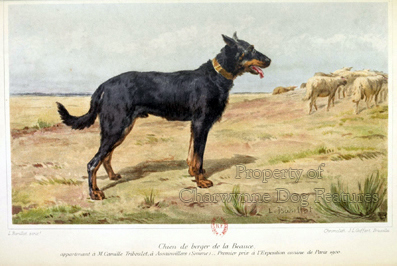 The Farou or Berger du Languedoc, also called the Berger de Camargue and Chien de Larzac is probably a southern version of the Beauceron. 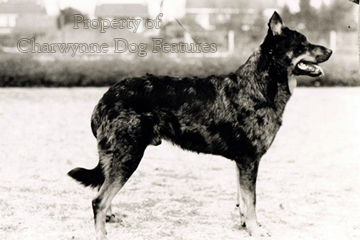 The Beauceron has the classic outline/phenotype of the Northern European herding breed types, with its similarities in physique to the German, Dutch, Belgian Shepherd Dogs, the leggy collies of the Lake District and the original versions of the Smooth Collie, easily spotted. The old Welsh Hillman had this anatomy too. 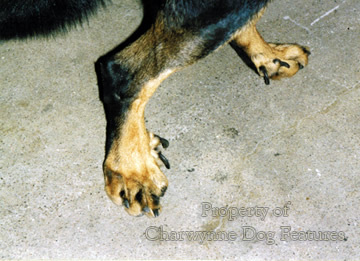 The Beauceron may have unusual feet, with the extra hind-toe, but its use as a working and service dog in France in the late 19th and early 20th centuries led to it being widely admired and widely used. 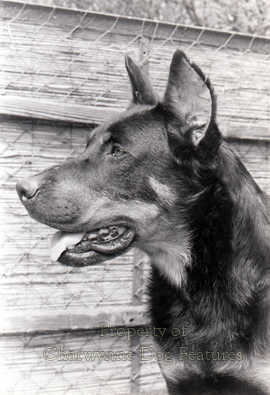 The GSD and then the Malinois may have ruled the roost from the early 20th century onwards, but copycat/fashion alone may have led to the honest, workmanlike, serious-minded Beauceron being overtake n. At French dog shows, in their first fifty years, the two most favoured French pastoral breeds were the Briard and the Beauceron. 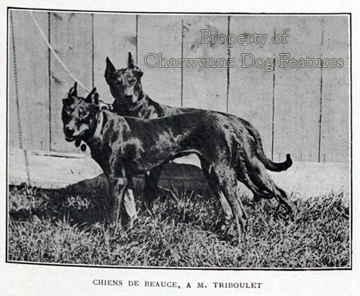 A French livestock breeder, who used both these breeds as herders, once claimed to me that they were one and the same breed, with the Briard being the long-coated variety and the Beauceron the smooth-coated variety of the French national pastoral dog. He found the Beauceron to be the better cattle-driver, considering them a 'mentally-tougher' breed. The French Armed Forces and Police Service certainly made good use of them, before the German dog became the universal service dog. This admirable working breed deserves wider recognition and greater use. The Beauce Shepherd has been described as 'un gentilhomme campagnard' or country gentleman and the 'king of sheepdogs' in France; it is very surprising that a breed of such distinct quality isn't far more widely known - and used. It may have made its name on the plains around Paris but on sheer merit it should make its mark much wider afield, especially as a service dog where its innate character rewards its handlers. 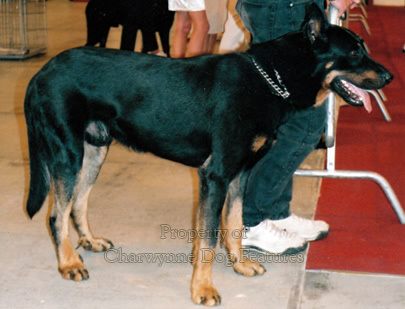 With the GSDs sadly now being so badly bred, and their often crippled anatomy actually being prized by misguided fanciers, a revival of the Beauceron would be very timely.